Audi A4 Allroad Review 2019 | What Car? At first glance, the Audi A4 Allroad may seem like a bit of an odd choice. Sat between the regular A4 Avant and the Q5 SUV, it is effectively an estate car wearing high-heeled Wellington boots. As strange as that sounds, Audi certainly sold plenty of Allroads in both A4 and A6 flavours. With that in mind, it’s no surprise to see the all-new A4 getting the soft-roader treatment. It may not look too different, but it’s all change underneath including a more efficient quattro four-wheel drive system for some models. On paper it doesn’t seem to offer any additional practicality over a regular A4 Avant, and you probably won’t really notice the extra height that the jacked-up suspension gives, either. 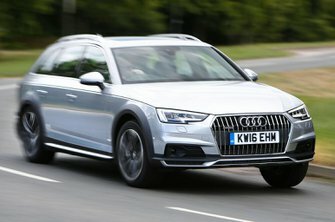 Read on over the next few pages to get our in depth impressions of the A4 Allroad, and our choice of engines and trims, as well as to find out if it's worth spending the extra over the regular A4 Avant.